Unsaturated polyester resin is the most important polymer for production of composite materials, mainly glass fiber–reinforced plastics (FRP), but also for casting resins (nonreinforced). FRP composites are consumed primarily by the construction, marine, and land transportation industries, although they ﬁnd use in a variety of other applications. Nonreinforced cross-linked unsaturated polyester resin is used to make cultured marble and solid-surface countertops, gel coats, automotive repair putty and ﬁller, and other items such as bowling balls and buttons (especially in China). Mergers, acquisitions, and plant closures continue to change the unsaturated polyester resin industry landscape. China is now the world's largest unsaturated polyester resin producer; capacity has been increasing and is forecast to remain positive in the coming years. The whole industry has experienced significant consolidation in the past few years, and plenty of small producers have exited the market, resulting in serious polarizing in the marketplace. Production increased significantly in 2015 as raw material prices dropped, largely as a result of low oil prices. The development of the synthetic marble market has stimulated the production of unsaturated polyester resin. Vinyl ester resins have become a hot research field in the Chinese unsaturated polyester resin industry. With the rapid development of desulfurization of power plants and dust elimination, demand for vinyl ester resins will continue to be a driving force for growth in the future. 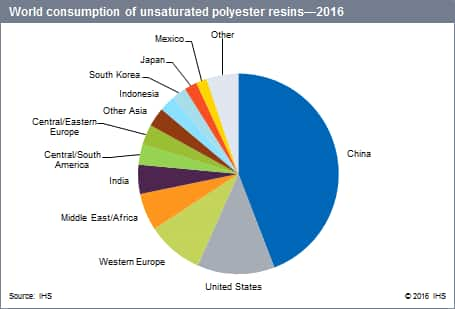 In 2015, the largest unsaturated polyester resin producing region was Asia (60%), followed by North America and Europe; China accounted for 44% of the global output. The recycling potential for unsaturated polyester is poor. The automotive industry, for one, is trying to reduce the number of polymers and use mainly unreinforced thermoplastics that can be more readily recycled. In Europe, the Waste Management Regulation of 2006 required automobiles (with widespread composite use) to be 95% reusable and recyclable by average weight per car starting in 2015. In Japan, recycling of used products (wastes) is the key issue allowing the expansion of unsaturated polyester resin markets. Research and development continues in this area including recycling methods and use of recycled materials. In 2015, the largest consuming region was Asia, followed by North America and Europe; China was the largest consuming country, with 44% of the total. The unsaturated polyester resin industry is mature and largely dependent on general economic conditions. Consumption growth will be highest in China, with an average annual growth rate of about 5% for 2015–21; Asia's consumption will increase at an average annual rate of 6% during 2015–21. Other regions will grow at rates of 2.5–4%. In Japan, unsaturated polyester resins consumption is forecast to decline at an average rate of 0.5% per year during 2015–21. World consumption is forecast grow at an average annual rate of 4.3%.